Takenaka Kotaro 1p (White) versus Matsubayashi Yoshihiko 1p in the Spring Oteai April 1934. The result - Black wins by resignation. White finally left the upper right with 20 and the players proceeded to divide up the rest of the board in a more normal fashion. I am fairly confident that this game does not appear too frequently in fuseki dictionaries! 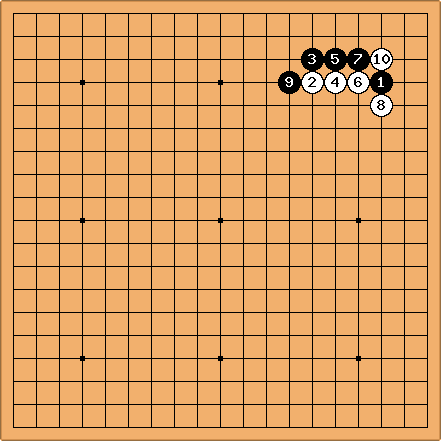 Anonymous: Or rather, the players continue to do the same thing on each corner. See NoFuseki for the continuation, likely these two pages should be combined somehow. Phelan: NoFuseki is an alias for Joban. I don't see the continuation there... The position seems different at least. 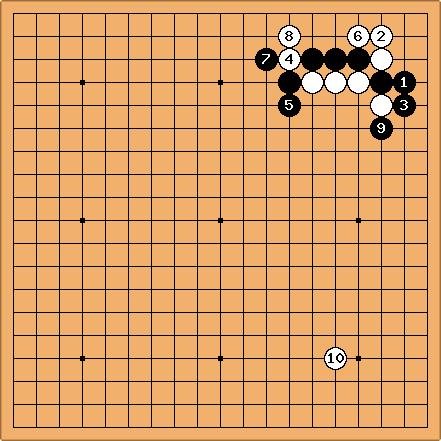 Anonymous : There is a similar opening in 2014 Gu Li vs Ke Jie, which results in black Ke Jia win.